Christmas is such a wonderful time of year! It can be soo stressful but when the day is here we all seem to forget that and Enjoy the time with Family! This year we had Christmas Eve just our little family .. and than we had the get together with Gregs family on Christmas Day! 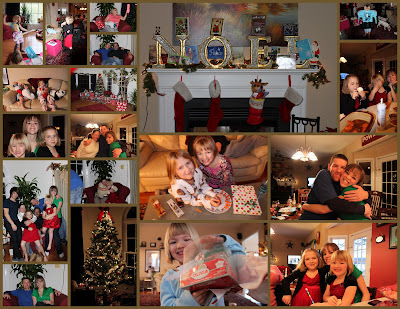 I love seeing my girls open up all their gifts and get so excited for what they recieved! Some of the memorable gifts are.. Pillow Pets, Paper Jam Guitars, Wii Games (karoake and Drawing Pad), just to name a few there are many more that are Favorites! Thank you all for making this Christmas Memorable with the Cards, gifts, and Love that was felt throughout this time of Year! Wether we are close or far away we are all Family and Grateful for Everyone of you! 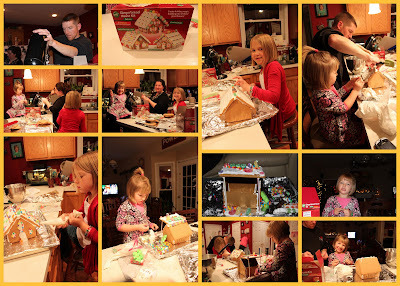 We made a decision last year that we would have an annual Gingerbread Contest.. so this year I went and bought 2 kits and we were ready to go .. not sure if it was the anticipation or the chaos.. but Neither House worked good this year .. Haylees started to break and so Greg added a top swinging door (like a Trailor Park ) oopps did I say that! And Kaitlyn had hers all together when all of a sudden it fell apart and she was devistated! So here you have it .. The work in progress!!!! 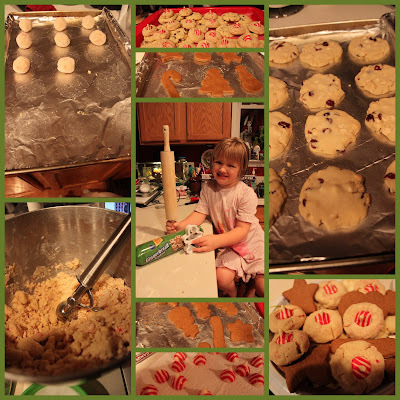 I had a bunch of recipes I wanted to try or make again since last year.. and sooo Haylee and I got Cookie Crazy!!! We went to town making Hershey Kiss Cookies, Gingerbread, and my Favorite White Chocolate and Cranberry Cookies! We had fun making them all .. I had to take half of them to work though.. cause I knew that I would Eat them all!!! Haylee Loved that I would let her cut out the Shapes of the Gingerbread and we kept some for Santa.. which made her happy! and of course Santa .. Loved.. Them ! I love cookies and making new recipes !! Just wish I could eat them all with No.....Guilt! This year the girls school had a visit from Santa! It worked out perfect for us!! We showed up at the school and stood in line for 10 minutes and saw Santa!! Yippee!! So Haylee was soo excited she ran right up on his lap and said I want a Dolphin Pillow Pet.. and than there was Kaitlyn who wasnt to sure but since none of her friends were there she wasnt to cool to sit on his lap, so she did it! She asked him for DS games which was news to Mommy(lets see if that happens)! After that they had Apple Cider and Hot Chocolate .. I think we were there for 25 minutes it was Perfect!! Ho Ho Ho!! !